If you are searching for an affordable vacation getaway with a Caribbean atmosphere, filled with sunshine, tropical breezes, warm, clear blue ocean waters, and white sandy beaches stretching as far as you can see – Our Private Ocean side Studio Condo is just what you have been looking for! Whether you are seeking a quiet lazy vacation soaking the sun on the beach or by the pool, or if you are looking for water sport activities, gambling, shopping, or if you desire to dance the night way in the clubs or at Count Bassie Square, our condo is the place to be. Our recently renovated nonsmoking unit is located on the third floor at Coral Beach and has a beautiful view of the Ocean from the balcony. 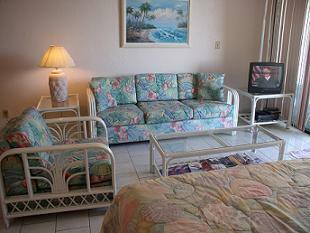 You can vacation in our Bahamas Studio Condominium for about the same cost as a Florida vacation. A private condo rental is far more affordable than a hotel rental…. there are no hidden fees or “hotel tax” to pay. Our condo is located just a few steps from the white sand beach, ocean and pool. Coral Beach Condominiums is located on the South shore of the Grand Bahama Island right on Silver Reef Beach. Conveniently located within easy and quick access to the Airport and Downtown Freeport and only a few minutes walk down the beach or a short ride to Port Lucaya where you will find numerous shops and nightly entertainment, as well as sidewalk cafes and several excellent restaurants. 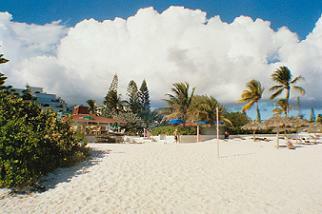 Freeport offers a safe and quiet vacation spot for families as well as singles seeking an active "night life." It's location midway between Port Lucaya and downtown Freeport, make it a short ten minute ride to most Island activities and restaurants. Studio condo features a new king size bed and a standard size couch in the den. A roll-away single bed can be made available if required. Number of bathrooms: 1 full bath with private dressing area. Our Fully equipped kitchen features all new appliances including electric stove/oven, refrigerator, microwave, toaster, and coffee maker. We provide all dishes, pots and pans, cooking utensils, and flatware for your use. Our condo is complete with air conditioning, overhead fans, a telephone with answering machine for out going local calls and all incoming calls, and a view of the ocean from the balcony. The unscreened balcony provides a beautiful view over the courtyard, beach and Ocean, a great place to watch the sunrise. The family den area features a couch, easy chair and Color TV with cable and VCR. For an additional nightly rental fee, use of my private vehicle can be arranged. It is kept in a reserved parking space in our secured parking area within 50 feet of the rear entrance to the condominium. Easy access from many major US cities as well as direct flights from many East coast cities (Baltimore, MD - Charlotte, NC - Atlanta, GA - Miami and Ft. Lauderdale, FLA). Sports and water sports activities are abundant such as Scuba Diving, Deep Sea Fishing, Swimming, Snorkeling, Boating, Sailing, kayaking, Water-skiing, Para sailing, and Jet-skiing. Many of the best SCUBA dive sites are located just off the South Shore and pristine beaches of Port Lucaya. Other activities include Golf, Fitness Center (on premises), Miniature golf, Horseback Riding, Bowling, Movies, Restaurants, Sightseeing. For those so inclined, ample and quality shopping is located in Freeport and Port Lucaya, a short 10 minutes from the condo. The Island boasts two casinos for those who like to gamble. There is a wide variety of foods offered at the numerous fine restaurants in Port Lucaya, Freeport and the West End. Enjoy everything from native dishes like Cracked Conch to fine Italian dining. Live entertainment is provided every night in Count Basie Square (named in honor of William (Count) Basie, Jazz pianist, and conductor ) in the center of the Port Lucaya Marketplace. We will provide you with a recommended listing of our family's favorite activities, restaurants and Island info with your signed lease. Rental rates begin at $75 per night during Off - Peak Season, $85 per night during Peak Season. Discount rates are available for rentals of three weeks or more. Contact us for a rate quote. In addition, there is a one time housekeeping fee of $50 for all rentals. All rates quoted are in US Dollars. Payment by Bank Draft or Money Order. Contact us by email at eanx2@comcast.net to inquire about availability and further information. Deposits 50% required to secure your booking, balance due 30 days prior to arrival. Year round..... contact me for availability and rates.